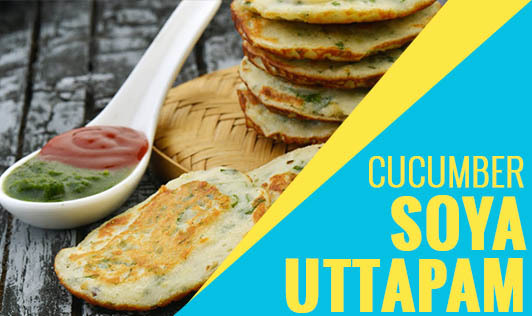 Cucumber Soya Uttapam is a fantastic pancake that will surely make your day! These sumptuous uttapams possess good amounts of protein and antioxidants, and are extremely easy to make. They are also only lightly flavored with green chilies and coriander. 1. Mix the grated cucumber, soya flour, rava, green chilies, coriander, and curd together in a bowl. 2. Add 1 cup of water and mix it well to make a batter of dropping consistency. 3. Heat a non-stick tava or pan and grease it lightly with ¼ tsp of oil. 4. Now take a ladleful of batter and pour it in the center. 5. Now spread the batter in a circular motion to make a thick uttapam. 6. Add a little oil on top of the uttapam. 7. Cook till it is golden brown on both sides. • You can add more vegetables of your choice to make it healthier.